Write Your Heart Out Workshop | Kayann Short, Ph.D. When we have a story to tell, chronological order only gets us so far. This workshop will focus on spiraling out from a beginning point to create deeper layers of meaning and expression. Working from first thoughts and elusive intuitions, we’ll shape a story to reflect its keenest heart. Let imaginative and practical guidance inspire creative movement through supported interaction. This workshop is open to women from all levels of experience and interest in story-centered writing. Contact kshort@greenspeedisp.net or 303-823-0975 to register now for Write Your Heart Out. Writing from Nature’s Artifacts. 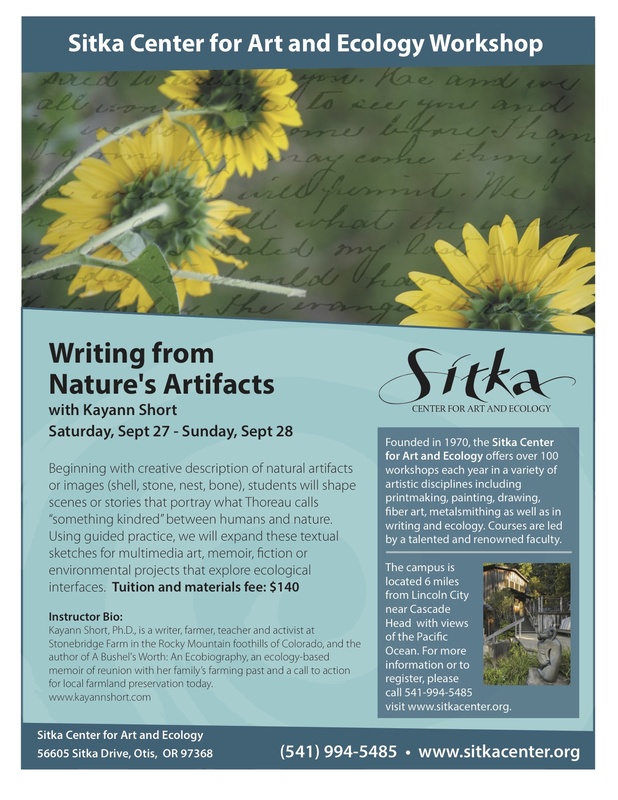 Sitka Center for Art and Ecology. Oregon Coast. Beginning with creative description of natural artifacts or images (shell, stone, nest, bone), students will shape scenes or stories that portray what Thoreau calls “something kindred” between humans and nature. Using guided practice, we will expand these textual sketches for multimedia art, memoir, fiction, or environmental projects that explore ecological interfaces.